The crew of Serenity, on the TV show Firefly, provided a much more intriguing look at the ideals of chivalry than some critics have claimed. We know what chivalry really is, and we know chivalry and honor are integral elements in some of the greatest western and science fiction stories ever created, so we must now ask: Did Joss Whedon’s “western in space” fail because chivalry and Serenity are mutually exclusive? 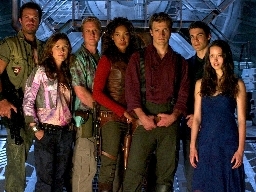 Malcolm Reynolds (the captain of the ship Serenity and the main character of the Firefly series, pictured with cast, third from right) may not be as honorable as a Star Fleet officer or as worthy as a Jedi knight, but there’s no denying that he has a moral compass, even if its needle wavers from time to time. If Mal was devoid of chivalry he would be nothing but a brutal space pirate, and Firefly would be quite a different show. But Serenity’s captain possesses an innate sense of chivalry that cannot be entirely dislodged, even by the horrors of war and the pain of disillusionment. Perhaps a clearer summary of chivalry has never been uttered. Of course, there’s no question that Mal’s motives in these situations are sometimes cloudy — but in the tradition of internally conflicted western heroes, this is what makes him such an interesting character. And this brings us to one final aspect of Firefly that, perhaps more than anything else, cements the presence of chivalry within the universe of the show: the concept of “ennoblement.” Throughout the brief run of the show, the crew of Serenity faces a variety of situations that place them in both physical and moral danger. Without a sense of chivalry and honor, the characters of Firefly would simply take their profits and run, laughing all the while at anyone who would be so naïve as to be hindered by conscience, duty or affection — but that’s not the case. What we see is that Serenity’s crew struggles toward honorable deeds — sometimes uncertainly and often reluctantly, but in the end they are all changed for the better by a greater awareness of chivalry. The character Jayne, perhaps the darkest and most brutal character on TV’s Firefly, also provides the most interesting look at the effects of the ideals of honor and chivalry. This is a very different Jayne than the one we see in “Out of Gas” and “Jaynestown,” whose fickle loyalty has an obvious (and fairly low) cash value. 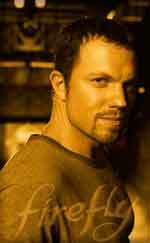 But as a result of his exposure to honorable people throughout Firefly’s story arc, Jayne begins to develop a sense of honor — his concern for his reputation has risen above his concern for his own well being, and this is a tremendous, essential change for such a character. A tacit understanding of chivalry drives Jayne to transcend his baser nature, just as it does for nearly all of the characters in Firefly. Courage, loyalty, compassion, faith and mercy —the virtues incorporated into the code of chivalry — can be seen guiding, affecting and transforming the Serenity’s crew, turning brutality into strength and avarice into responsibility, despite (or perhaps because of) contact with corrupt Alliance officials, brutal Reaver pirates, untrustworthy petty crime lords and any number of other disreputable desperadoes who populate Firefly’s ’verse. Critics who cannot see chivalry in Firefly have lost sight of the fact that this ancient code of honor is deeply woven into the fabric of the marvelous characters who fly aboard Serenity. Chivalry is as crucial to the structure of Firefly as a foundation is to a skyscraper: Both are buried beneath the surface, invisible to the casual observer, but each is an indispensable part of a magnificent creation. If chivalry played any part in Firefly’s failure, it was merely because the concept, as treated by Joss Whedon, may have proved too complex for viewers who could not, or would not rise above stereotypical notions of old-fashioned characters, stories and motives based on a code of chivalry more suited for bedtime stories and singing cowboys than for a metaphorical drama depicting the challenges of maintaining honor in a void. Viewers who came to Firefly with open minds and discerning intellects, however, discovered a synergistic, genre-bending universe where knights in shining armor sometimes wore brown coats, where a futuristic frontier became a proving ground for an ancient code of honor, and where lost shepherds, space hookers and roguish space-freighter captains could discover chivalry by finding Serenity.